Can other religions be merged into Christianity? Let's talk about the apostasy of merging other religions into Christianity. Look at Christian Wicca. We are witnessing this merger primarily among our teens today. This involves a blending of witchcraft and Christianity. One young Christian Wiccan teenage girl said, "I started studying the book Earth Power which is by Witch Scott Cunningham, and I started to dabble in some of its practices and a few others. I purchased The Craft by Dorothy Morrison and Wicca a Guide for the Solitary Practitioner by Cunningham. I found myself in a faith that I could truly hold dear to my heart." How deceived! She did say, "I did however feel somewhat empty still. Jesus had been a part of my life for almost three years and has helped me become who I am today. I started looking into Christian Wicca then." Then she says, "I followed the Wiccan Rede." That's their ethical principle that says you shouldn't harm anybody, "but also take the Ten Commandments to heart greatly. 'You shall not hold any gods before me.' This is one that people really don't get when it comes to my beliefs. I believe that there is only one true God, and that all other gods are part of the one. The Christian Trinity, the Father, Son and Holy Spirit, is also somewhat a reflection of this. I view it as god, goddess (or the feminine quality of God) and Jesus as all still being part of one being." Can you now see that we've got a big problem among our teens today? If it that wasn't bad enough, we've got Chrislam making its way into our midst. This unholy merger says that Christianity and Islam are compatible and that both the Bible and the Qur'an are holy texts that contain similar teachings between the two on morals and ethics. It also teaches that we worship the same God. Followers of Chrislam say that we both worship the God of Abraham and therefore we worship the same God. Now, is that true? Absolutely not! The Qur'an and Muslims will tell you that there is no such thing as the Trinity. The concept is heresy to them. Jesus is absolutely not God to a Muslim, and so how dare anyone claim that anyone is Allah's equal. This is just a bunch of linguistic nonsense when trying to argue that Christianity and Islam are compatible. They absolutely are not compatible. Be sober-minded and be watchful. Be firm in your faith. It's a simple statement, but it says it all, doesn't it? Be sober minded, be watchful, and be firm in your faith. I might add, never give up. Fight the good fight of the faith and never give up! Contend for the faith that once for all has been delivered to the Saints, and never give up. That's what I desire for every person in Jesus Christ. I want to end with a bit of good news. If you have accepted Jesus as Savior, soon you and I will be in the AFZ. The AFZ — that's the Apostasy Free Zone. That's right! One day you and I will live in the New Jerusalem, the eternal city of God, which will come down from Heaven onto a new earth. We will have resurrected bodies and we will live in a resurrected universe, and the word apostasy will not even be in the dictionary. So true. I have seen the merging of religions with Christianity for some time now. But it is at a fevers pitch at this time. It is a fearful time and I only see it getting worse. Will we really soon be in an apostasy free zone or is this still yet just a lie? 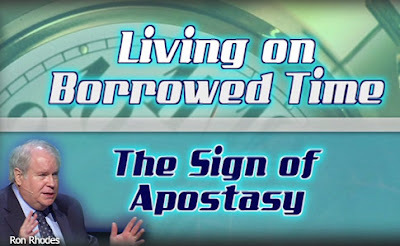 Dr. Rhodes' mention of an Apostasy Free Zone is in reference to the Millennial Kingdom, which will see a falling away only at the very end by many of those born during that time and who are in their earthly bodies.